I can’t believe that the weekend is over…..they go so fast! 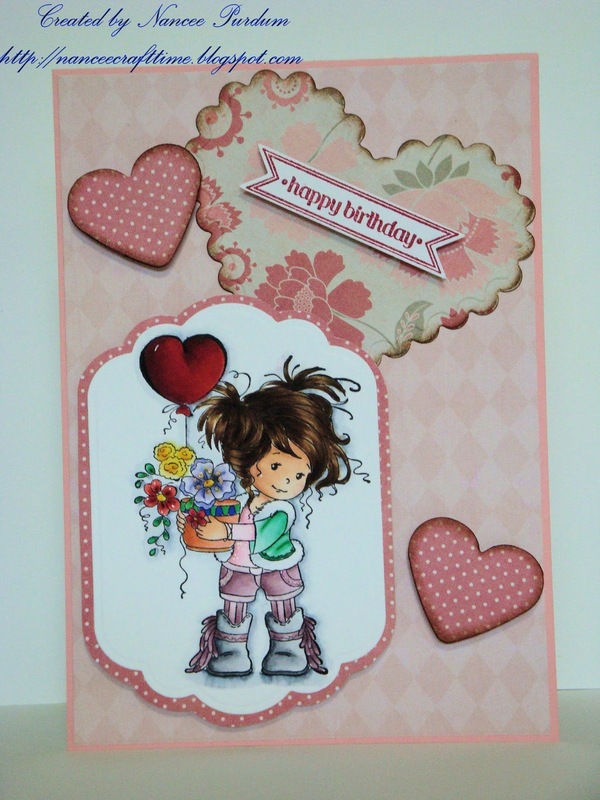 I finished another birthday card, and this time I used one of my new Wee stamps. I have a niece named Amiee, so I decided to use the new Wee Amy stamp for my first Wee card. I stamped the image with Memento Tuxedo Black ink. I colored her with my Copic markers. For her skin, I used E000, E01, E11, E21, and R81. Her clothes are colored with G000, G00, G02, G05, RV10, RV11, RV13, RV91, RV93, and RV95. For her hair, I used E51, E53, E55, E57, and E59. The Heart is colored with R22, R24, R27, R29, and R39; the leaves are G02, G05, G07, G16; the flowers are BV0000, BV000, BV02, BV04, R22, R24, R27, R29, R39, Y11, Y13, Y15, Y17; and the flower pot is colored with E93, E95, E97, G05, and B28. Whew! That’s a lot of colors! A close up of Amy…..
My paper is from Recollections, Flower Garden. The sentiment is from Stampin Up, Itty Bitty Banners and Framelets. I also used a Spellbinders die cut and a heart punch I had on hand. Thanks for stopping by! Back to work tomorrow! Monthend this week, so I’ll be busy, busy, busy with work. Oh my gosh, this is adorable. 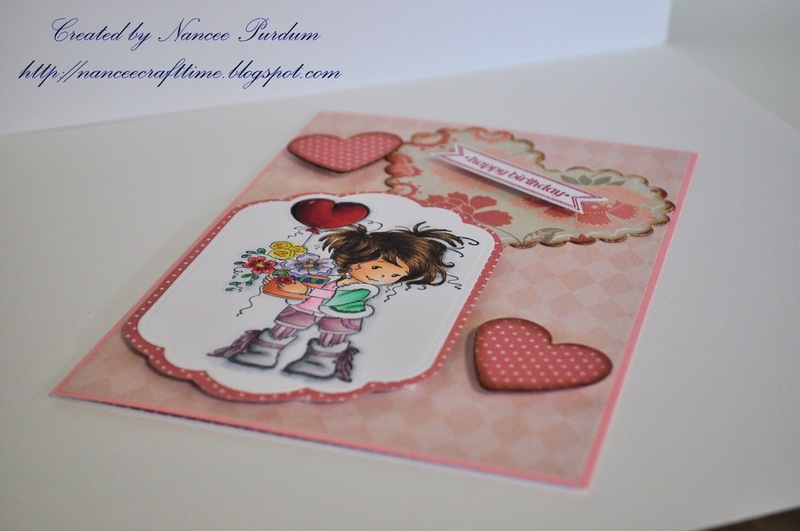 Awww…Nancee this Wee stamp is a cutie. Love how you colored her. Such a cute image and you have coloured her most beautifully! 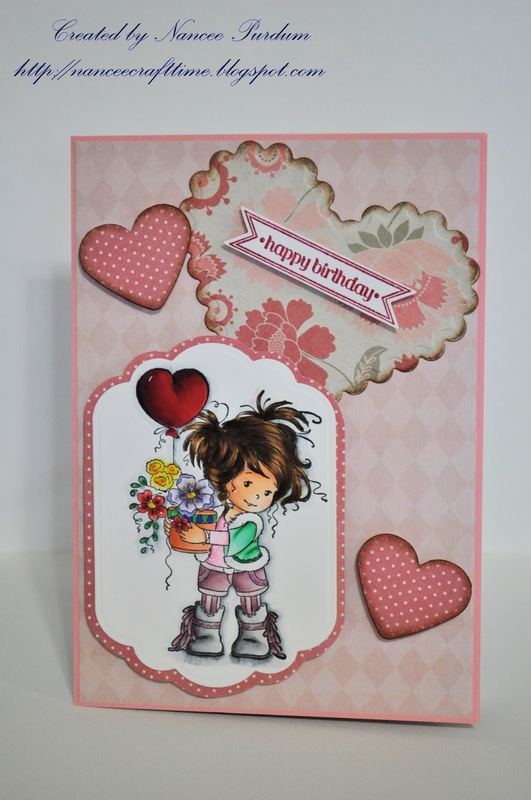 She will love your card, this image is so sweet and your card is loving and cheerful. ADORABLE!!!! 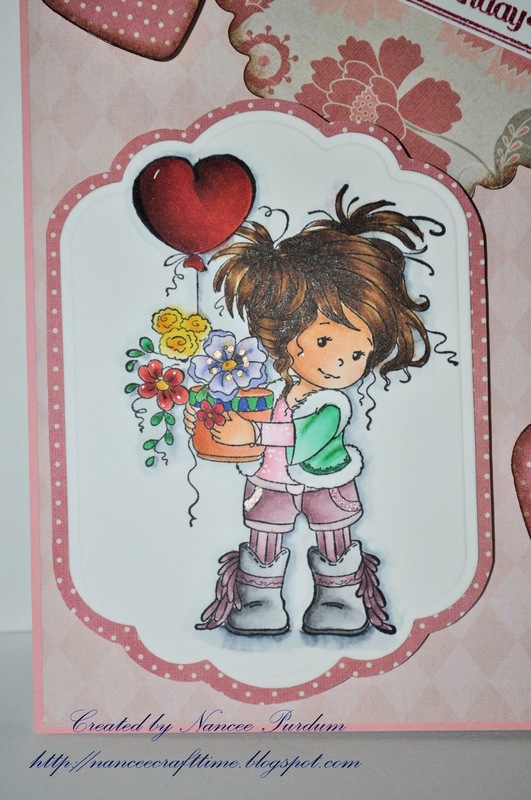 Don't you just love to color these wee stamps!?!? Utterly gorgeous, your coloring is stunning and I love those pretty hearts. Adorable! These stamps are really cute! Great stamp, and so beautifully colored! This is ADORABLE!!!!! Great coloring!! hugs and have a great week……..